Reference number for this case: 22-Sep-54-Dole. Thank you for including this reference number in any correspondence with me regarding this case. JOEUF. (From our newsroom). -- The area of the East will end up invaded by beings coming from one does not know where, if one believes all the witnesses who, for a few days, have claimed to have seen here and there, cigars and flying saucers, unless they are craft used during the air army manoeuvres which are currently going on. 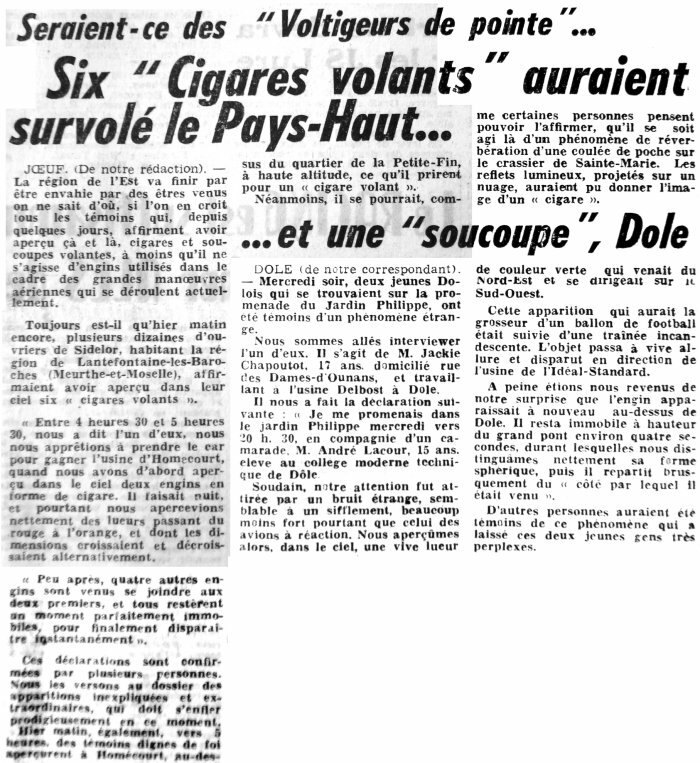 Anyway, yesterday morning again, several tens of workmen of Sidelor, living in the area of Lantéfontaine-les-Baroches (the Meurthe-et-Moselle), claim to have seen six "flying cigars" in the sky. "Between 4 hours 30 and 5 hours 30, one of them told us, we were about to take the bus to reach the factory of Homecourt, when we first saw in the sky two cigar-shaped craft. It was dark, and yet we clearly saw the gleams changing from the red to the orange, whose dimensions grew and decreased alternatively. "A little later four other craft came to join the two first, and all remained perfectly motionless one moment, to finally disappear instantaneously. These statements are confirmed by several people. We pour them into the file of the unexplained and extraordinary appearances, which must swell prodigiously in this moment. Yesterday morning, also around 5 hours, witnesses worthy of faith saw in Homecourt, above the district of the Petite-fin, at high altitude, what they took for a "flying cigar". Nevertheless, it could be, as some people think they can say it, a phenomenon of reverberation of a pocket casting on the mining dump of Sainte-Marie. The luminous reflections, projected on a cloud, could have produced the image of a "cigar". DOLE (from our correspondent). -- Wednesday evening, two young people from Dole who were on the walk of the Philippe garden, were witnesses of a strange phenomenon. We went to interview one of them. It is Mr. Jackie Chapoutot, aged 17, domiciled street of the Dame-d'Ounan, and working at the Delbost factory in Dole. He gave us the following statement: "I walked in the Philippe garden Wednesday around 08:30 p.m., in company of a comrade, Mr. André Lacour, aged 15, pupil at the modern technical college of Dôle. Suddenly, our attention was drawn by a strange noise, similar to a whistling sound, much less loud however than that of the jet planes. We then saw, in the sky, a sharp gleam of green color, which came from the North-East and moved to the South-west. This appearance which would have the size of a soccer ball was followed of an incandescent trail. The object passed at sharp pace and disappeared in the direction of the Idéal-Standard factory. We had hardly recovered from our surprise when the craft appeared again above Dôle. It remained motionless at the level of the grand-pont for approximately 4 seconds, during which we clearly distinguished its spherical form, then it set out again suddenly on the "side by which it had come". Other people reportedly also witnessed this phenomenon which left these two young people very perplexed. The two authors indicates that they talked to the witness of the observation of September 22, 1954 in Dôle. He told them to have seen towards 08:30 p.m., a fugitive gleam, very luminous which crossed the sky without stopping with a rectilinear trajectory. "Two young people of Dôle who were in the Philippe garden were witnesses of a strange phenomenon. Here is what one of them, Jacky Chapoutot, 17 years, resident with Dôle, stated: "I walked in the Philippe garden, accompanied by a comrade, André Lacour, aged 21, pupil at the modern technical college of Dôle. Suddenly our attention was drawn by a strange noise similar to a whistle. Looking up, we saw a sharp gleam of green color in the sky, coming from the North-East, moving towards the South-west. This appearance which had the size of a soccer ball was followed of an incandescent trail. The object went at sharp pace and disappeared. Hardly did we recover from our surprise that the craft again appeared above Dôle. It remained motionless at the height of the large bridge approximately 4 seconds during which we distinguished its spherical shape clearly, then it set out again suddenly on the side from where it came." The website indicates that on 22 September 1954 at 20:30 in Dole, France "An unidentified object was sighted, but with appearance and behavior that most likely would have a conventional explanation. One object was observed by two witnesses." Barthel and Brucker are as usual very puzzling and not very eager apparently not to add confusions in this account which might have been simply explained if indeed they spoke to the witness and if they had taken the trouble to properly conduct a formal investigation, something completely absent in their book. They suggest that the account in the newspaper does not match to that of the witness. Actually, it is apparent that the first observed phenomenon is described in the same manner in the newspaper and in the remarks that they allot to the witness: on the one hand "a fugitive gleam, very luminous which crossed the sky without stopping with a rectilinear trajectory" and on the other hand "a sharp gleam of green color coming from the North-East, moving towards the South-west, which had the size of a soccer ball and was followed of an incandescent trail", "passed at a sharp pace and disappeared." In both cases we have the identical description of a meteor, it is simply more complete in the newspaper, including trail, color and direction. They accuse the newspaper of addition of "a plethora of details" (whereas they accuse the lack of details of other Press reports). But in fact, the first "added" detail is that of the strange sound. It is actually quite possible that if the witness really observed the entry of a large meteorite in the atmosphere, they could as well hear a strange noise. Sometimes, meteors experts still tend to think that it is impossible to hear a meteorite travel through the air because the speed of sound in the air is incredibly slower than that of the meteor. However, there are many cases of meteor witnesses who say that they first heard a strange sound or strange sounds, and only looked at in the sky precisely because of these sounds, and then saw the meteor there. It is the Australian specialist Colin Keay who solved the enigma: the meteor ionizes the air and this creates low frequency radio waves, which arrive at the witnesses quasi instantaneously since they travel at the speed of light. The only problem was that in theory, you cannot hear radio waves with your ears. But Keay set up all kinds of experiments to solve this mystery and in 2001, he noticed that such radio waves make all kinds of materials vibrate and emit sound, such aluminum foil, pine needles, frizzy hair etc. These are the sounds, often eerie, even varying from one person to another, that the witnesses can perceive with their ears. The other detail that the newspaper "added" is that of the trail. It is obvious that they probably saw a trail, if it was a meteor, and that Barthel and Brucker perhaps simply omitted to question this witness seriously. In addition, the witnesses say that the object appeared again. But this time, it had a spherical shape, no more trail, and sets out again "on the side where it had come from." Obviously that cannot be a meteor, nor the meteor which they had just seen. It was something else, which remains unidentified. It is possible that it was an embellishment by the newspaper, but the lack of Barthel and Brucker to indicate exactly what they did ask or did not ask is the reason for which one can hardly know what occurred exactly. Possibly, after seeing a meteor, they saw a plane. And finally, it seems that neither the witnesses nor the newspaper explicitly said this was a flying saucer, and this case is completely missing in the ufological casuistry, Barthel and Brucker being the only ones to introduce it there as far as I know. Is it once again an example of the good old UFO-skeptics trick, which consists in adding IFOs to the UFOs file for better convincing their readers than any UFO is a commonplace natural phenomenon when not a hoax? As a matter of fact, they do write this case shows that all the other cases for September 22, 1954, are explained as this same meteor. I quote the authors: "We had on September 22, 1954, 10 "UFOs" sighting; we are left with nothing. A simple investigation identified the flying objects that weren't!" Possible meteor, and then maybe plane. 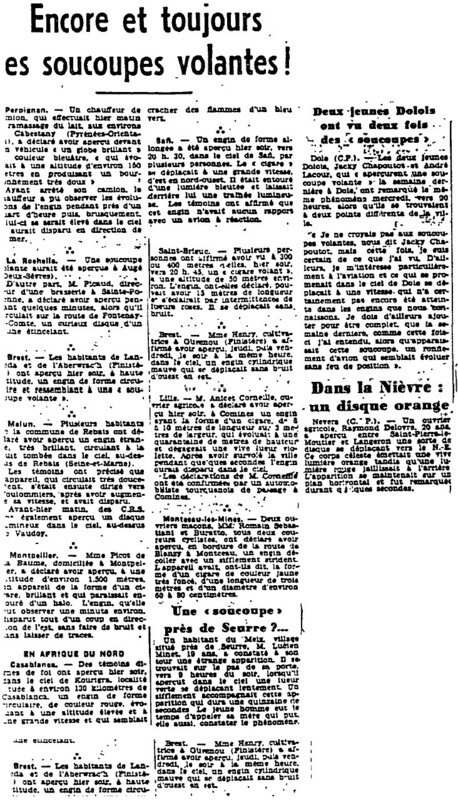 [le1] Article in the regional newspaper L'Est Républicain, France, September 26, 1954. [---] Article in the newspaper Le Bien Public, France, October 1954. [bb1] "La Grande Peur Martienne", book by Gerard Barthel and Jacques Brucker, Les Nouvelles Editions Rationalistes publishers, France, pp 172-173, 1979. 1.1 Patrick Gross June 1, 2010 Addition [le1]. 1.2 Patrick Gross December 22, 2016 Addition [pr1]. 1.3 Patrick Gross January 31, 2017 Addition [ub1].